Back on-line! Sorry for not having been very communicative since nearly a year… Anyway, time for an update on the vintage, harvest and other issues. 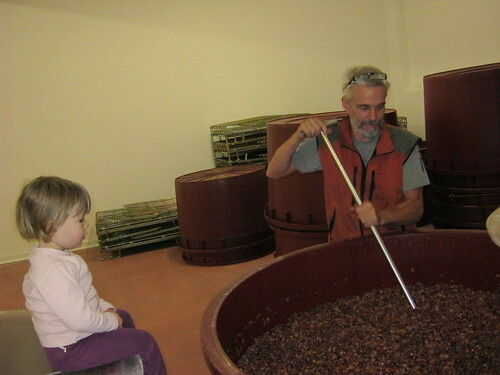 In short, 2011 was an incredibly intense year in terms of work in the vineyards and family. We started really well pruning early and being way ahead of time with the pruning work. Worked well all the vineyards which needed a bit of help and so we dug out the soil around the vines to give them more air and water absorption. Slammed in many new poles, rebuilt stone walls after the heavy winter rains, … The rain, snow and humidity were great until February but as of March we ended up in a spiral of work because vegetation was exploding and from being ahead of time, we were running 3 weeks behind. The accumulated humidity in the soil resulted in the presence of mildew and so we had less crop overall. On top of this, powdery mildew had also showed up in our two most ventilated vineyards. A rare phenomena which will have a logical explanation but so far I haven’t completely understood the exact reasons why this happened. A possible factor might have been the late pruning in March which results in vegetation starting later and consequently this fragile vegetation of the vines is more subject to mildew attacks. Consequently, this year we started pruning mid December to avoid this situation. Due to the powdery mildew, we had no other choice than to treat the grapes with liquid sulfur the whole month of July until mid august. End of august we started already with the cleaning of all bursted berries in the clusters until mid September. September was beautiful and so the picking of the grapes for our rosato, Susucaru, was like a walk in the park. A nice way to get into the rhythm for the “big job” in October. Meanwhile Aki was due for birth of our second child and on October 3rd Arturo was born, between the rosato and the first Nerello! A bit chaotic but we managed in the end. The grapes were very good to perfect with high concentrations, especially for the Nerello Mascalese. Even our base wine i 2012 has very high density and alcohol level. No 2011 red wine is below 15%!! The Monte Colla vineyard had incredibly low yield this year: 8.000 vines produced 1.000 bottles of wine… an intense and dense wine this will become. I was a bit worried with the alcohol levels in the beginning but the wines seem to balance themselves out nicely. I feel we have a potentially great vintage but this will be demonstrated by the wines in the end. Right after the harvest we started with the olives. Lots of picking this year with potential Magma olives! In the end I decided not to produce Magma olive oil as the San Benedetto olives did not reach perfect maturity. The autumn had been too warm and there had not been enough temperature exchange to reach maturity. All San Benedetto olives went into the MunJebel olive oil. Modern (pruning) times on Etna! This entry was posted on Sunday, January 15th, 2012 at 12:22 pm	and is filed under Work in Progress. You can follow any responses to this entry through the RSS 2.0 feed. Both comments and pings are currently closed.